This split image of Shackleton crater shows the structure of the crater in false color on the left. 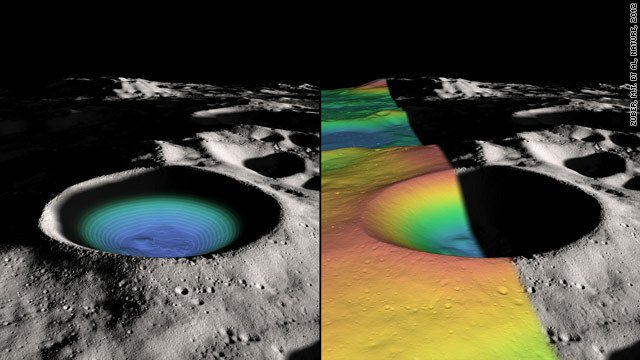 The image on the right shows the elevation of the crater (in color) and shaded relief (in greyscale). If humanity ever colonizes the moon, we'll need the help of local resources, like water and solar power. The lunar poles, which contain regions of constant sunlight, as well as constant darkness, could be ideal locations for finding both. Scientists have exciting new insights about the south pole in particular: A study released in Nature today suggests that there is frozen water within a massive, well-preserved crater there. The Shackleton crater is more than 12 miles in diameter and about two miles deep, and exists in permanent shadow. While the evidence for ice in the crater has been inconsistent, this new study, conducted by scientists at Massachusetts Institute of Technology, Brown University and NASA's Goddard Space Flight Center, finds evidence for ice on the floor of the crater. The research team, led by Maria Zuber of MIT's Department of Earth, Atmospheric and Planetary Sciences, used an instrument called a laser altimeter aboard NASA's Lunar Reconnaissance Orbiter (LRO) to create a highly detailed topographical map of Shackleton crater. The laser basically lit up the area, allowing the team to measure the natural reflectivity (albedo) of the crater's interior, which Zuber describes as "extremely rugged." Those measurements revealed that the crater's floor is much brighter than the floor of other nearby craters, which is consistent with ice in the area. Ice may make up 22% of the first micron-thick layer of the crater's floor, which Zuber says is about 100 gallons - not too much. However, these measurements aren't at all indicative of what ice may be beneath the surface. The researchers also observed that the crater's walls were brighter than the floor - a surprise, given that the thinking was that if ice present were inside Shackleton, it'd be on the floor, since there's even less sunlight reaching the bottom of the crater than its walls. Zuber and her team explain the brighter walls by theorizing that occasional "moonquakes" might cause older, darker soil on Shackleton's walls to slide off, revealing brighter soil underneath. LRO orbits the moon from pole to pole, which allows the laser altimeter to map a different slice of the moon with each orbit. Each slice contains data from both lunar poles. Zuber and her team ultimately used over 5 million measurements of Shackleton crater to create their map, which is unprecedented in its level of detail and helpful for studying crater formation and other lunar processes. Detailed maps like these are also useful for planning future robotic or human missions. One of those future missions is NASA's Gravity Recovery and Interior Laboratory (GRAIL) spacecraft, also in orbit around the Moon. "We'll be attempting to detect evidence for subsurface ice this fall," says Zuber.